Toshiba has announced that its new dynaEdge AR smart glasses solution, which is coupled with a mini PC running Windows 10 Pro, is now available in the US at a starting price of $1,900 (£1,420, AU$2,520). 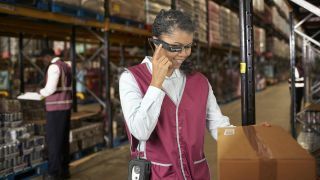 The package is a full hands-free solution consisting of the dynaEdge AR100 smart glasses (developed in conjunction with Vuzix), along with the dynaEdge DE-100 Mobile Mini PC, and accessories (including a carrying case, USB-C lead and cable clip). The PC is a lightweight ‘edge computing’ device with an Intel Core vPro processor (Skylake), and a swappable battery with a longevity of 6.5 hours. Toshiba will also offer a pair of Developer’s Kits in both ‘basic’ and ‘performance’ configurations, for those who wish to design their own custom software for the smart glasses. Pricing will start at $2,400 (£1,800, AU$3,180) for these kits, with the buyer able to specify different CPU, memory and SSD storage options for the DE-100 Mini PC. Toshiba’s provided Vision DE Suite facilitates a range of remote usage scenarios and is integrated with Skype for Business. The software will allow those in the field to record and stream live video, or send photos and share files with those back in the office, or indeed engage in video calls via Skype.